Adel says Sabs is the most photogenic but total opposite in real life. Jon says Andrew looks like a perv*rt! Big Brother Spoilers > Big Brother Canada > Season 2 > Adel says Sabs is the most photogenic but total opposite in real life. Jon says Andrew looks like a perv*rt! 12:40pm – 1:50pm Big Brother puts the house guests on a backyard lock down again. Neda comments on how Heather’s HG photo looks like she’s a wax figure. Jon says Ika looks stunning! Andrew is a dunce. Big Brother wakes up the Gremlins. Sabrina says if I hated poultry before I do now! Neda agrees and says when we get out lets go kill them. Jon says that’s pyscho. Neda says she just means to go help the farmers kill them. Adel says that he thinks Sabs is the most photogenic but total opposite in real life. Jon says Andrew looks like a tool. He looks like a pervert. Neda hates her own picture because he nose looks big. Jon and Neda say Paul looks exactly the same in real life. Adel says I don’t think I would be friends with Sab’s, Andrew or Allison. Jon says I don’t think I would be friends with Sarah or Kenny after. None of them think that Andrew is waiting for Allison and that he is out there sleeping with other people. Adel asks do you think chick are going to like Arlie. Jon says no. He says he gets a lot of girls but I don’t know. 1:10pm – 2pmRachelle tells Sabrina that she saw Neda and Heather whispering earlier. Sabrina says I literally don’t care if they send me home and don’t follow through with what they say. Sabrina talks about all the places they’re going to go and things they’ll do when they get out. Sabrina and Rachelle head inside and talk to the others about why they’re locked out for so long. Sabrina says its either serious big fun or serious big serious! Like something like a twist .. like serious big serious like f**k or serious big fun. Neda says she thinks the twist would be tomorrow. 2:15pm Neda, Jon and Adel talk about how people in the house are peeing in the shower. Adel says he does it if he’s in there and it just happens. Neda says that she doesn’t get why people leave their soap and loofah’s on the floor with people peeing in the shower. Jon says he doesn’t and says you guys call me the dirt bag. Adel brings up how Jon j*rks off in the shower. Adel says someone’s going to get impregnated by Jon from using the loofahs that are left on the floor of the shower. 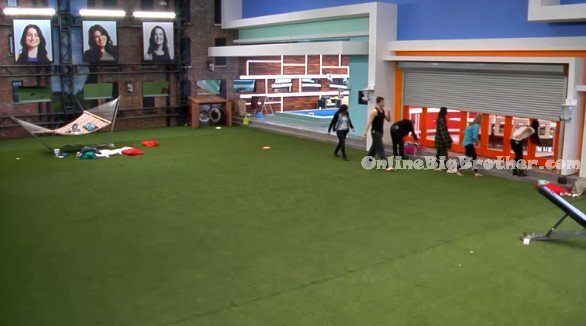 2:15pm – 2:25pmBig Brother opens up the house again and all the house guests rush inside to see if anything is different. The find a new mug shot mug and Sabrina and Neda talk about how hot the guy is. Neda says hit me up mug guy! Jon says that’s all you girls care about is appearance. In the kitchen Adel tells Heather, Neda and Jon that its going to be questions about where the mugs were placed. 2:35pm – 3pm Neda joins Jon in the HOH room. She asks him what he wants to do tomorrow. Jon says he would rather take Sabs or Delli to final 3. Neda and Jon discuss either throwing the HOH to Sabrina or winning it. Jon says if we won HOH I think we should put Heather and Sabrina up. Neda says then we would have tell Sabrina that we’re keeping her and we vote out Heather. Jon says its best for our game for Heather not to be here. Neda says good reasons for people not to vote for Adel is that he’s floated to the end and attached himself to us. 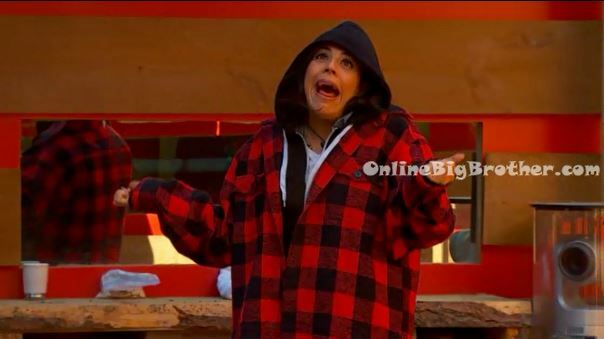 Neda asks why would people vote for Heather in the end. Jon says because they wouldn’t want us to win. 3pm – 3:30pm Adel gets the HOH camera and brings it up to the HOH room for them to take photos. Heather and Neda do a video “This is Head’s & Ned’s – We love you Canada!” Neda, Heather, Adel and Jon start taking photos all over the HOH room. They comment on how they’ll let Sabrina and Rachelle know about the camera when they have a half hour left. They head into the main bedroom to put Neda’s shirt on for the photos. Sabrina asks if something is going on. Neda says we got the camera. The Gremlins ask if they were going to tell them. Neda says we got it only like 10 minutes ago. Jon says like 5 minutes ago. Sabrina and Rachelle join them in taking photos. 3:45pm Up in the HOH room – Adel does a video with Jon recording and says he’s going to make it to final 2 maybe final 4 I don’t know what’s going to happen. Adel then worries that the others heard him say final 2. He tells Jon to delete it. They then do it again and Adel says final 4 with me and the sloppy seconds! 3:55pm – 4:10pm In the bedroom – Sabrina says they think they can win everything! deals off! I’m over it! I am done! Oh my god I hate them! Jon was doing this .. its not his show! Sabrina says they’re awful humans! 4:20pm – 5pmSabrina says I may shoot myself! I want to self-evict tomorrow! Did you see how many pictures they took without us?! And they were rushing us! I can’t live in this house without you! Sabrina says they threw out your condiments. Sabrina says I’m having a heart attack. I can’t feel my legs or my arms. Rachelle says don’t. Sabrina asks do you see who I’m left here with! Rachelle says its kind of depressing leaving. Sabrina says its depressing staying. Rachelle says no its depressing the experience is almost done. Sabrina watches Rachelle pack her bags. Sabrina tells Rachelle I can’t be here go tell him.. try and stay so that I can go home. 5:10pm Neda making slopsicles in the kitchen. Did Heather get the strategy sesh with Emmett and Jillian? I have heard or seen anything to that effect BB. Neda got the strategy session because she is the one that won the POV. Production strikes again!!! I knew Neda couldn’t be so stupid to actually throw F5 HOH. A few “geniuses” here actually tried to defend that hair brained scheme. ROFL I said this when the idea 1st surfaced that production was likely behind it. Now for the interesting bit will Sabby go to Deli and spill the whole plan? Will they change the target and evict Sabby tomorrow? Do either Deli or Heather have a chance against Joneda? Lots of questions yet to be answered. Sabby has 1 thing going for her and that is she can poison the jury. She knows where a lot of BB HG’s bodies are buried this season. I like Joneda’s chances if it’s endurance to come out with HOH. It would be good if they actually got away from the “no blood on your hands” thinking that seems all to common most BB seasons lately. It’s Sabby and who up if they are HOH? Either Heather or Adel are going to know where they are on the totem pole. Jon likely puts up Heather as a pawn. Neda should put up Adel. Neda and Jon talking today it seemed like Neda was getting off the Heather bus which I don’t get. How does taking Adel F3 benefit her versus taking Heather? She’d have a lock sitting F2 at the finale as both Heather and Jon would take her. Neda fans gotta hope she’s just laying low to see who wins the next HOH. Like her, I do not, or not she has set herself up to win the game better than anyone by a country mile. For her fans you should be very happy the production insanity has come to an end and Joneda aren’t throwing anything! I don’t recall reading one comment that defended the potential plan of throwing the HOH to Sabrina. Some musing about why consider it or or possible outcome if it was thrown. But nope, not one comment ‘defending’ the plan. Don’t let your faulty memory keep you from the facts. The threads have comments and my responses both Monday and Tuesday. Perhaps you should stop guessing and educate yourself 1st. Missing something on the feeds is a “I don’t recall moment”. Suggesting I was not truthful about my comments in previous threads being responses to pro “throw the HOH” folks is irresponsible at minimum. I’m trying to be polite your just plain WRONG. Sabrina is definitely a beautiful girl facially. I don’t think she has a horrible body, she is just short and is not assize 2. If she toned up she would easily be the hottest. However, she is a prime example of how one’s character and personality affects their level of hotness. P.s did you guys see Adel’s girlfriend? OMG, she is so stunning. Abby Chebli is her name on social media and she is so nice. i thought there was no have-nots this week so why is neda a have-not now? i missed something obviously. can someone explain. Neda was put on slop after the houseguests easter egg hunt. Either she got the least eggs or something but she is on slop until Thursday. The gremlins Are both Absolutley Gorgeous Girls! They should start a reality tv show…idc i like them & i’m not afraid to admitt it. It should be like The Simple Life. Both are spoiled rich girls, so they can work at car washes, fast food kitchens, dairy farms, stuff like that. An episode where they work at a mirror factory would be too good! I would definitely watch it, and so would lots of people. Even their haters would watch, just so they can keep hating. The Simple Life was a terrible show about vapid people. Thankfully it’s not on anymore–I tried watching it once and found it cringe-inducing. A reality show where they do what exactly ‘name’? Make pucker faces to any all mirrors in their path? Put on make-up? Implode about how nobody likes me or hates me or the mailman was mean? What exactly do these 2 nothings have to offer the world via TV? Or they just walk around crying and calling everyone “stupid”. ZZZZZZZ boring feeds does anyone know wish some of first 5 had stay and gotten out John and Neda. Is there anyone hope Heather will win HOH and can be push to get put up John and/or Neda are we left with a predicted end game. I’m done listening to all this game talk. They’re all just blowing cigar smoke up each other’s sphincters. We need to see the DR recordings to know where their heads are really at. The DR recordings are contrived production footage. You want to see their real intentions look at noms, renoms and votes on eviction night! “Actions speak louder than words” and with the lying in any BB season you can magnify the quotes 10 fold!!! wat if sabrina actually makes it to final 2 omg what if she ends up winning the hole game??!! sabrina has the best skin & her hair is friggen gorgeous!!!! I can’t figure any of these people out. im guessing production wants jon and neda in the end? it would have been better if it was jon and neda vs heather sabrina and adel….. from a tv drama stand point this option would have been the best… im hoping if sabrina does get hoh she decide to go back on her word and put up jon and neda.. taking out the power duo should be the only move the 3 should be thinking about, its really pointless for them to take each other out…. production definetly needs to talk to sabrina or heather if this two win hoh…..
Are those two seriously p*ssed off because they didn’t get to use the camera 100% of the time, for themselves? they got enough shots as group and solo, etc, more than sufficient. they sat like lumps when the others came in with the camera, getting changed. All they worry about is how long did they have the camera for before coming in, within seconds Neda told them the camera was there, it often is on Wednesdays anyway isnt’ it. And wasn’t just a short time earlier, S is fixing up the makeup on R, to me that sounds like they were waiting for it, then bad sports when it actually showed up. I’ve determined that the only reason Rachelle is in the BB house is that she has to do a paper for her psychology degree on the most absurd houseguest in the BB house. At this point it’s super obvious who has the best game, so if certain scenarios do or don’t play out it will be obvious if they were influenced by production or not. Sabrina being so damn dramatic acting like she doesn’t want to stay without Rachelle. I understand why Rachelle is being voted out but how amazing would it be if Sabrina got blindsided & evicted instead. save roro atleast roro would put jon and adel up…. i cant believe sabrina is going to trust jon and neda again after what just happened this week…. im really hoping sabrina puts up jon and neda if she gets hoh….